Active and In Touch, Active Living, Somerset You Can do, Fair Frome and The Men’s Shed. Local volunteers and organisations that work to support the local community were thanked for their efforts in a special gathering, at the Cheese & Grain. Volunteers and members from Active and In Touch Frome were joined by many of the different Active Living Groups, run by Somerset You Can Do, such as PACE, Frome Day Care, The Carers Group and the Widow(er)s Support and Social Group, as well as other organisations including Frome’s Men’s Shed, Fair Frome, HOPE Frome and Mendip Health Walks. 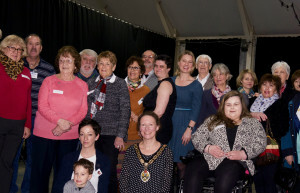 It was an opportunity to showcase and celebrate the wealth of support that Frome and the surrounding villages has on offer to help the elderly, the vulnerable or those suffering from isolation. Frome Mayor, Kate Bielby, thanked the volunteers by saying, “Loneliness and isolation can affect any one of us at any point in our lives. A change in circumstance or life event can have a devastating effect on our ability to get on and just be ourselves. “We are lucky to have some amazing organisations locally, like Active and In Touch and The Men’s Shed, to provide the right kind of individual and personal support when people need a little extra help. Cllr Bielby opened proceedings with a welcome speech and David Warburton MP, who unfortunately could not be at the event due to Parliamentary commitments, gave a video message to all the assembled volunteers. He said, “Active and In Touch, together with the many different Active Living Groups, work incredibly hard to offer the best possible support for the elderly and those in need of companionship and friendship in Frome. Active and In Touch volunteer befrienders spend time with those who may be in need of a little help, find out their needs and interests, and help them to find their own place in the community.